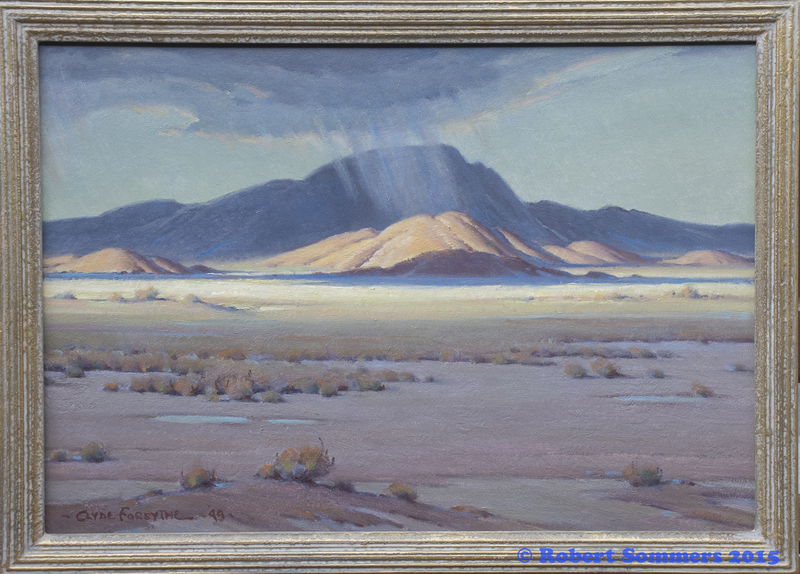 Clyde Forsythe (1885-1962) Rain on desert oil on masonite 15.5 x 23″ dated 1949 l/l titled on frame and dated Feb 41 (sic?) p.o.r. This is such a great painting. A hole in the clouds just after a desert rain, with a rainburst in the background for good measure. I rarely see Clyde Forsythe’s work, the late Chuck Coffman used to carry his paintings in Palm Springs, now what a character he was! This painting evokes Dixon, Percival and Weaver, the best of the impressionist desert painters. In fact Clyde was a friend of the former and one of the first of the particular genre known as desert painters. This painting resides in its original frame. Really nice if you one of those of us attracted to these paintings. You are or you aren’t and it’s okay either way. I am. The following bio is from AskArt. It was written by Edan Milton Hughes. Edan was an art dealer of many years standing and an associate as well as arguably the most seminal and competent researcher on California painters. I hear that Edan died a few weeks ago. The man’s work chronicling California artists was immense and titanic and we Callifornia art dealers and aficionados owe him a large debt of gratitude for his scholarship. Born in Orange, California to parents who had just moved to California from Tombstone, Arizona, Clyde Forsythe was among the first American artists known as the Desert Painters. He had heard stories throughout his youth of his parents’ life running a store next to the OK Corral where Marshal Wyatt Earp, his brothers, and Doc Holliday fought the Clanton-McLowery gang in 1881. Later Forsythe made good use of this subject matter. As a boy he had plenty of space to explore in canyons and mountains, and this free life style continued even when his family moved to Los Angeles in the 1890s because there was plenty of wide open space. He and his family also did a lot of camping in the California desert, which stirred in him a life-long fascination for that subject matter. Showing early art talent, he was encouraged by his family who sent him in 1904 to New York to the Art Students League. In New York, he worked at the New York Journal as a cartoonist with Jimmy Swinnerton, worked briefly in St. Louis, and then took a job at the Examiner in Los Angeles. He returned to New York to replace George Harriman, cartoonist for the New York American. During World War I, he did many war posters, and was a mentor to Norman Rockwell whom he introduced to Saturday Evening Post personnel. In 1920, at the peak of his New York career, where he and his wife Cotta lived high and socialized with prominent illustrators such as Dean Cornwell, Charles Dana Gibson, and Howard Chandler Christy, Clyde decided to give it up to indulge his urge to paint the desert. He headed West and not only painted the desert but those who populated it including prospectors with whom he would stay at their campsites. One of his paintings dated 1952 is The Fight at OK Corral and shows his parents’ store, Chandler and Forsythe, in the background. He shared a studio with Frank Tenney Johnson and was friends with western characters such as Will Rogers, Charles Russell, and Ed Borein. 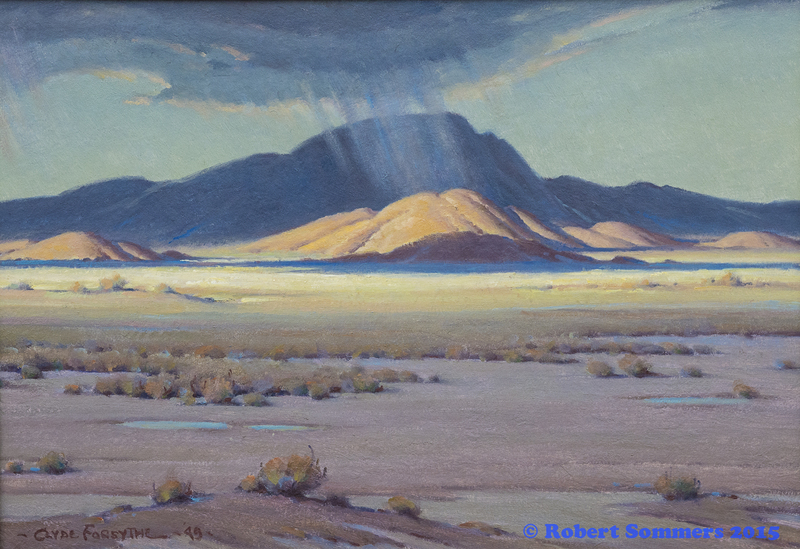 He and Jimmy Swinnerton, and Maynard Dixon, the other “Desert Painters,” shared many painting trips.